Anemic is the word that comes to mind when I think about how to describe the 2013-14 winter. 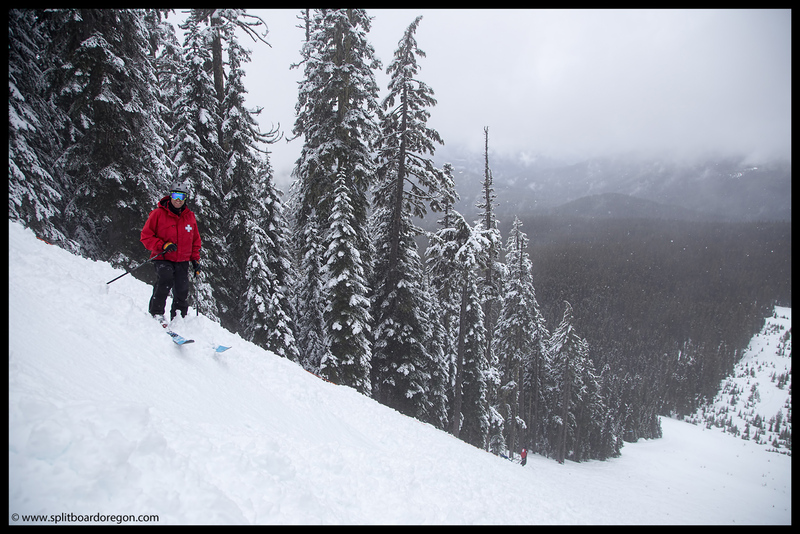 After one of the latest starts to the season in the last 40 years at Willamette Pass due to a snowless December and January, February delivered enough snow for a little fun and to finally open the entire mountain for a few weeks. Now, as we move into March, temperatures have warmed considerably and we’ve been greeted with several warm storms delivering rain in the mountains, compromising the shallow snowpack. Such is life, and sometimes you’ve got to play the hand you’re dealt. After a day of hitting the area with the family, I was back on Sunday for a day of patrol. John and I left Eugene around a quarter after six o’ clock, and the temperature was a balmy 56 degrees. It rained all the way up Highway 58, and was still raining as we pulled into the Pass parking area. The top quarter of the mountain was snow covered at least. After a longer than normal morning meeting (nobody was excited to head out in the rain), we filed out and opened the mountain. The rain gave way to snow two thirds of the way up the EPA chair, and my first few runs down Timburr were actually decent. The lower part of the mountain was sticky and slow as expected. 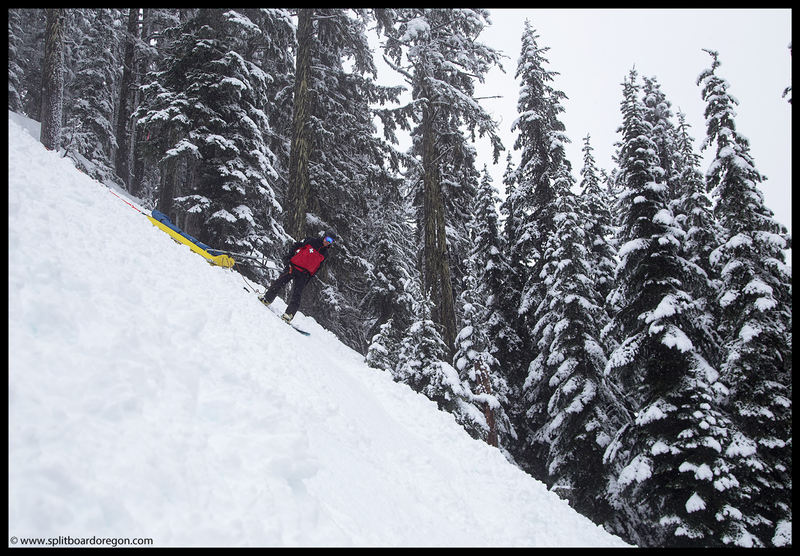 I headed over to Peak 2 next, and found a couple inches of fresh snow on Destiny and in the trees between Down Under and June’s Run. By the time I’d made three runs, the mountain was open and it was time to meet at the top of EPA for a training session on the RTS sled. RTS is the steepest run on the hill, around 50 degrees at the steepest part. 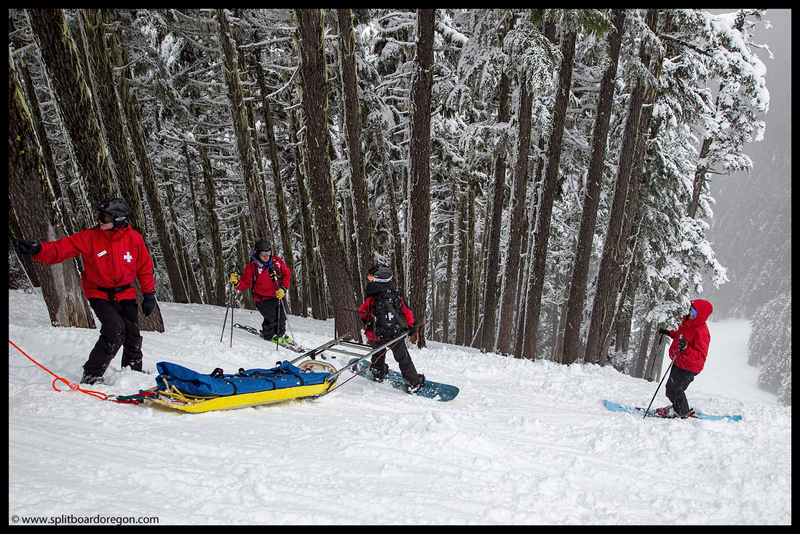 It’s the only run on the hill where Patrol lowers the sled down the hill when conditions dictate rather than ski it down. The whole process is quite simple actually, but practicing does ensure things go smoothly when and if a lower is needed. Basically, the sled gets clipped into a caribiner and rope, which runs through a lowering device that has tons of friction, all of which is anchored off to a large tree. Below, Toby demonstrates the lowering process….. 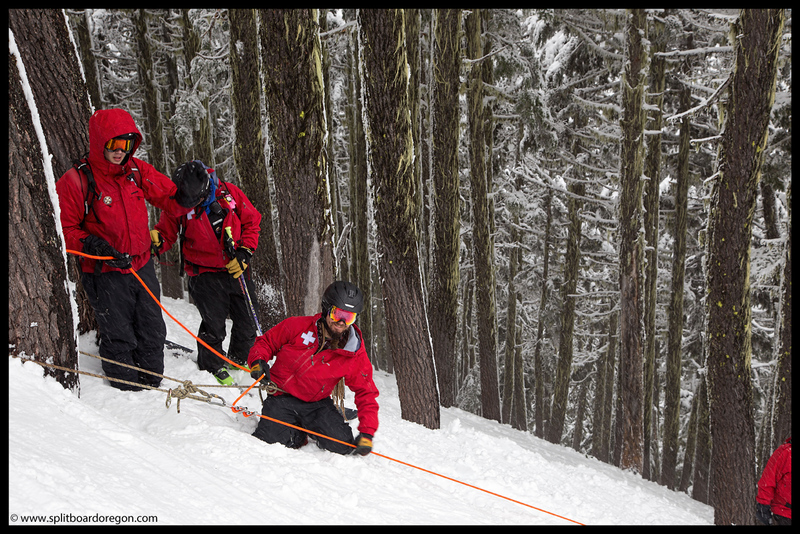 The patroller in the handles has the easy job of pointing their skis or snowboard downhill and just holding onto the handles. The main concern is to just keep the sled pointed straight down the fall line. Brian demonstrates below…. 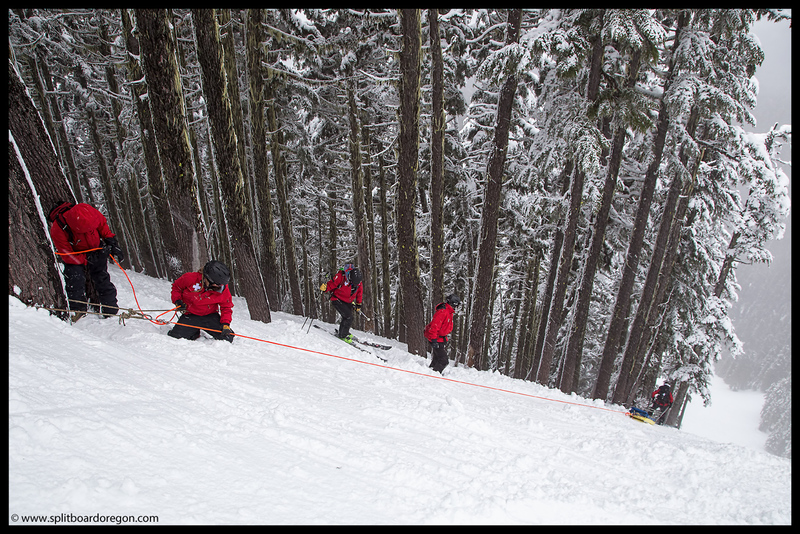 After lowering the sled down RTS twice, we dropped the rope and made turns to the bottom, stuffed it back into the rope pack, and radioed up to the top to reopen the run (the run is closed during a lower to ensure the rope doesn’t get skied over and cut). With training over, I went in for lunch, which afforded a brief period to dry off. After lunch, I made several runs with Raleigh, mostly on RTS. By now it was raining clear to the top of the hill, but it really wasn’t much of a bother, and I had big fun the rest of the afternoon. The snow actually skied quite well, and our turns were fast. It seems like some of my better turns on patrol (or at least most memorable) come when it’s raining. Plus I had the added bonus of knowing this was the 100th consecutive month in which I’ve made turns, a mark I’d been looking forward to for some time. 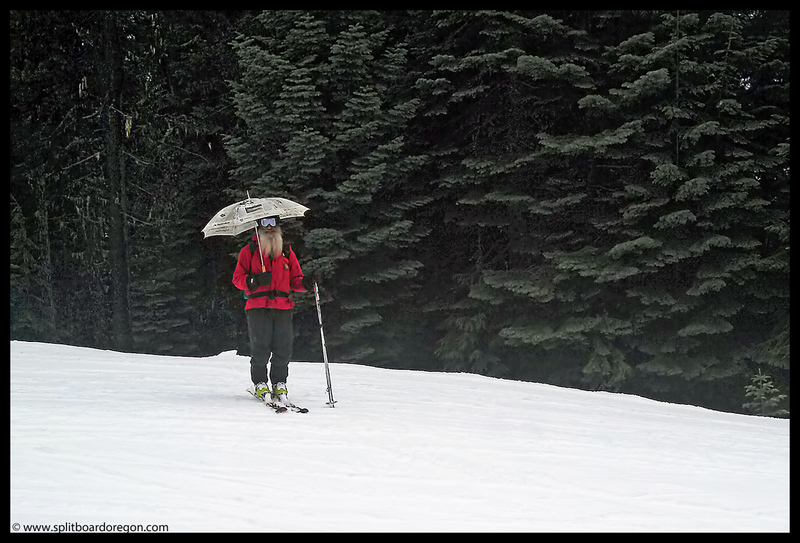 When it came time to sweep, I ended up on KP, and nearly fell over laughing when I looked over at John near the bottom of the run – he’d busted out the umbrella, and I had to snap a picture. Even though I’d put my camera away after lunch, I pulled out my cell phone and snapped the below photo…. Sitting in the aid room after a wet day, I found myself reflecting on the season and was thankful to just be making turns given how poor this winter has been. I knew it’d be a wet ride home, but it was definitely worth it to just be out in the mountains! Here’s a parting shot from the day of Ian on RTS….